Overall nice condition. Front cover, blank inside cover, first blank page have small stains. Inside pages are very nice and clean. Numerous individuals are mentioned within the text; the only biographies are of Civil War soldiers. Many historical photographs of individuals and buildings. Photos have the unusual characteristic of being printed in red tones rather than the typical grayscale tones. 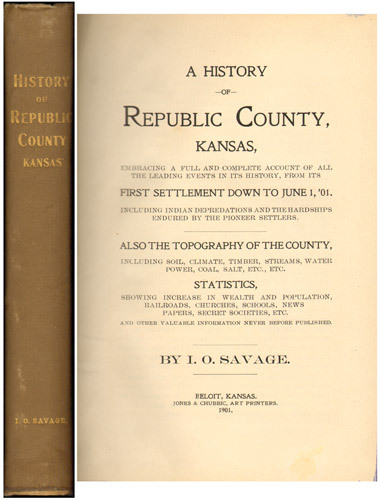 Also includes a foldout, colorful map of Republic County, Kansas. This map shows the location of each township, railroads, numerous cemeteries by name, and settlements that existed in 1901.